British author Stephan Collishaw has been closely involved with Lithuania since moving there on a whim in the mid-’90s. He published two novels in the early years of the last decade, The Last Girl and Amber, both taking as their inspiration Lithuania’s complicated and difficult history. 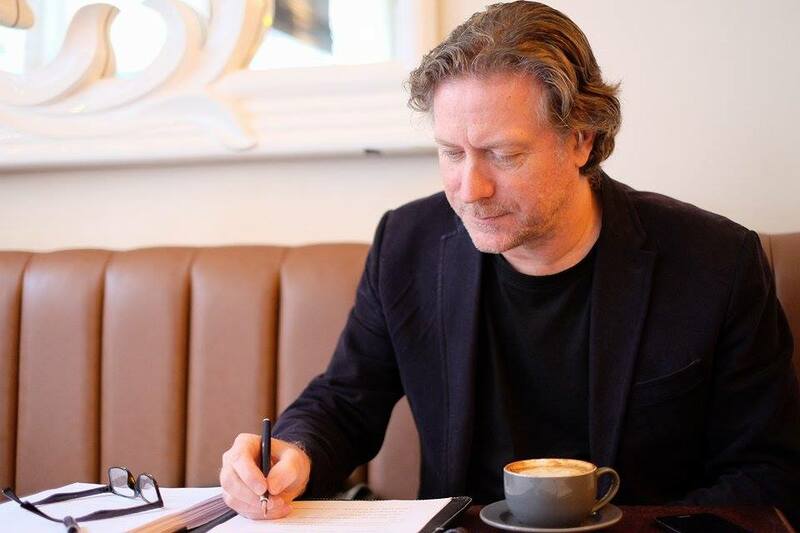 Having taken a break of over a decade from writing to concentrate on teaching – he now works as a deputy headteacher in his home city of Nottingham, where he lives with his children and Lithuanian wife, he returned to publishing earlier this year. The Song of the Stork is his most recent novel, and tells the story of a Jewish girl, Yael, caught amidst the fighting in Nazi-occupied Eastern Europe. As the book opens, she takes shelter in a farm owned by mute Aleksei, close to where the Polish-Lithuanian border had formerly been (and you can read an extract on Deep Baltic – here). When Deep Baltic spoke to Collishaw in late May in Nottingham, he’d just got back from a school reading group, where the students were reading a novel by the popular Lithuanian author Rūta Šepetys. I’d like to start off by talking about your most recent book in relation to your previous two novels – I’ve read The Last Girl; I couldn’t find a copy of Amber, but I’ve read a bit about it, so I have an idea about the theme. These both seem to be concerned from the traces that history leaves – particularly in Lithuania – but The Song of the Stork seems more explicitly a historical novel, in that it’s set during the period it’s concerned with. Was there any particular reason you decided to do that, or did it just seem like the right thing? History is kind of one of my big interests. I came into writing with a kind of background in history – when I was at university, my degree was in English and History, and the two have really entwined themselves in terms of what my personal interests are. About ten to fifteen years ago, I was really quite involved with history, especially around oral histories. And at that particular period of time, I did quite a bit of work doing oral histories with migrants from the Baltics and Eastern Europe to the [English] Midlands. So I published a collection of stories of Lithuanians who had migrated in 1948 as refugees. And then I did a project with a library, doing some of those oral histories as well. I think that kind of to an extent, that’s what the novel is in some ways – it’s a story. It’s a story of a young girl going through the traumas of a war, and I think, in terms of history, I’ve always been interested in how does the individual; how does the small, the irrelevant person – how are they affected by war? How does it enact upon them? So, for instance – certainly that instance of The Last Girl, you know – an ordinary person, a not-hero, how do they go on in the face of some of the dramatic choices that you have to make in times of war? Recently, going over to Lithuania a month ago, talking to people like Fania Yocheles Brantsovsky, who was in the ghetto during the Second World War, talking about her experiences with her, and also talking to my mother-in-law, which I did. I went and had a good conversation with my mother-in-law – something that my wife has never done herself – and certainly I’ve never had this conversation in the twenty years I’ve been married to my wife. She lived in Tauragė, close to Tilže [now Sovetsk, Kaliningrad], a place which was really bang-smack in the middle of the fighting, about what it was like for her as a young girl during the war. And it’s fascinating to hear the story of a thirteen-to-fifteen year-old girl who is on the front line, with her family – how do you exist, and how do you survive and the story of that. So part of it is a story of an ordinary person in extraordinary times. And I think that’s one of the things I’m really interested in. But obviously, in terms of The Song of the Stork, it was very much also to do with the narrative of people having their stories taken away from them. So telling stories, or not being able to tell stories. So, for me, the novel very much became about how important people’s individual voices are – that there are people who would like to suppress and silence the stories of the people they don’t like. It’s a really live issue wherever you go, but it’s a particularly live issue in Lithuania. Just as an example of this, I don’t know if you’ve ever been – close to Kaunas, there’s the Ethnographic Museum, at a place called Rumšiškės. Yeah, I was there in the autumn. So you’ll know, it’s a lovely, gorgeous place, beautiful. I was there in the spring with my children, and it was like a pastoral paradise – with the frogs in the pond, and then you come upon the little town, and it’s a beautiful little place. What I didn’t ask myself then, but have asked myself since is: where is the synagogue? Where is the tailor’s shop – the Jewish tailor’s shop? Where are all those things that were absolutely intrinsic to every town and village in Lithuania for hundreds and hundreds of years, and that only seem to exist in 1943, ‘42. Up until then, they were intrinsic parts of every village. And it’s just one of those very simple ways in which Lithuania has recreated its own history in the way it wants to do. It’s not a proper history – it’s a fictionalised version of their ethnicity, which takes out all the stories of a huge amount of the people who actually lived in those places. They’re just gone – they’re silenced; they’ve disappeared. It’s almost a second genocide, if you like – in terms of the fact that first, they kill them all off, then not content to kill them off, they go to eradicate them from the story of who they are as a nation. I hope it’s not a preachy book, but to an extent that’s what Yael’s character is are all about. They’re saying “how can you just take our story away from us as though we didn’t exist?”. Because you’ve had about a ten or twelve-year break between this and your previous novel. How long did that take to write? Were you writing for most of that period, or did you take a break from writing entirely? I really got sucked into it – it was an inner-city school in the centre of Nottingham. And it was a school I really believed it. It was a really mixed ethnic community, and the ward had one of the highest rates of poverty in the country, never mind in the city. Real social deprivation, and some real serious issues, and I loved being in a really dynamic environment and attempting to do something with it. And within six months to a year, I was leading the department and then deputy head of the school. And it was all-consuming, absolutely all-consuming, and incredibly exhausting. So I did write – I wrote another novel and this novel. I wrote three novels. I wrote one novel which was just – I stopped after a while because it really wasn’t working. And then I wrote a couple more novels – this one, and then another one which Legend have just bought to bring out next year. So there was some kind of activity going on that moment in time. But not a huge amount, because I think energetically I was just consumed with working in a school in inner-city Nottingham and, creatively too – because all of my creative energy was going into projects, trying to make it an interesting and exciting place to be. I can imagine that wouldn’t leave a lot of surplus energy. Yeah, when you’re doing a 70-hour week, which is pretty much a regular for any teacher, but when you’re working in an inner-city school in the climate of the English education system now, with all the very, very particular pressures that working with kids from socially disadvantaged backgrounds have – yeah, it kind of takes up most of your energy. So it’s kind of nice to step back. I stepped back two or three years ago – and I’ve stepped back very much with the idea that I wanted to re-engage myself with writing and doing some other things. So it’s kind of nice to have that happening, to have another book out. I wanted to pick up a little bit on this thing you said about your mother-in-law, who was living close to the border in – what was the name of the town you mentioned? She was in Tauragė. And actually before the war, she was in a place called Jurbarkas, which is about twenty kilometres from the border, I would imagine – 20-30 kilometres from the border. But it’s an interesting question actually, because pre-war that would have been Prussia – no, actually, right on the border with Prussia. Jurbarkas was just inside Lithuania, but very, very close to the border with Prussia. So that would be in Kaliningrad now? Or is it still in Lithuania? No, the border pushed back by about thirty kilometres, so the border pushed back to the river. I believe, I can’t say this with 100% veracity, but as far I understood, the Prussian border came over the Nemunas [river] by about twenty kilometres, so halfway towards Tauragė from what is now Panemunė, which is on the border now. So when the Russians liberated Lithuania, and gave Lithuania various slices of the surrounding countryside – obviously gave it the Vilnius region, and the Memel region [Klaipėda region] and that whole Prussian corner there – so they actually expanded the borders of Lithuania fairly considerably around that area. We spoke a little bit about this via email, the question of where this is actually set; which country it would be in now. Because in some of the promotional material from the book, it’s described as being in Lithuania, in others it’s been related to Poland. But there’s this line at one point where it refers to “Grodno, a town barely larger than Selo, but with a station from where trains ran directly to Vilna and Warsaw and Minsk”. And I found it really interesting, that all three of those cities are now in three different countries – and, in the case of Minsk, is quite hard to access from the others. Is it particularly significant that you set it in that region – a kind of indefinite region that almost doesn’t exist anymore? I think the region itself is really fascinating. I have to say, for me, it took a lot of getting round in my head in terms of the geography, because obviously we’re aware that in 1939, Hitler invades Poland. But the Germans don’t advance through the whole of what we now consider to be Poland – so they didn’t invade the Suwałki region in 1939, it’s only towards 1941 when that comes. So that would have been part of the Soviet Union at that point in time, so the borders are very, very different now to what they would become. But in our heads, we’re very wedded to the post-Second World War geography of Eastern Europe. And of course the post-Second World War geography of Eastern Europe is very, very different to the pre-Second World War geography of Eastern Europe – and different from the pre-First World War geography of Eastern Europe. And because of this state of insecurity, political insecurity of the Baltic states and the Eastern European states who feel – quite rightly, feel – that their very existence is threatened by Russia, I think there has been a tendency to talk about borders in a much more static way than is historically accurate, because I think they need to feel a sense that this is historically theirs and they have a historical right to it, and Russia doesn’t have a right to undermine the historical narrative of their independence. And I can see where that comes from, because I don’t think there’s any doubt that Russia would like to undermine that, but on the other hand, the reaction of the Baltic states and other Eastern European states in terms of their creation of narratives takes things in a very different direction that is also inaccurate, doesn’t allow for the ambiguities and the sharing and the multicultural nature of what that region was. Grodno – Gardinas, in Lithuanian – is now in Belarus, isn’t it? Just inside Belarus, close to the border with Poland, so it’s set around there. In actual fact, when I was doing the research for The Last Girl, I came across a fascinating book that was very much about – or certainly the part of it I was reading – was very much about the Meshugganahs – the kind of village idiots. And that’s where Selo came from, came into my original concept of that book. And I cannot now, having lost that book, place geographically exactly where it was. But I believe it would be inside where current Lithuania is, but it was around that Suwałki area. But it was a very interesting place that I had read of – where it seemed that the whole town had become a sanatorium for Meshugganah, for odd people, people with idiosyncrasies or eccentricities or disabilities of various different types. But yes, it’s the Pale, isn’t it? It’s the Pale of Settlement. Actually if you want to get one of my historical inaccuracies there, that is one thing that I should have taken advice on – very late I got the advice that it was not an appropriate name. And it does need to be point out that it’s not the most appropriate name for a Jewish girl from that region at that particular historical point in time. Why? Because it’s a very biblical name – and though it’s a name that might be quite common in Israel, it’s quite a Zionist name. Now there might be undertones for why I felt it was an appropriate name. Yael was the great female hero of biblical times – in particular, she was responsible for the killing of the king by sticking a tent peg through his head. So there are resonances for the novel as a whole where we’re talking about a young girl developing a sense of power and desire to fight back. But in terms of its historical accuracy for Poland and Lithuania in the 1930s, it probably would have been quite an unusual name. My apologies, that was a digression. It was an interesting digression! My original question was about this question of home which comes up again and again. Yael seems to makes a strange kind of home with Aleksei – although the concept is mocked a little bit by Eva when she appears, and says “you think I’m a threat to your little home”. It’s a story of a war between two sides, and it seems that even though most of the characters are obviously they’re more sympathetic to the Soviets – or at least clearly would prefer them to win the war compared to the Nazis, one of the partisans points out at one moment that Stalin would see them as “byezrodini”, which is without a country, without a home. And then even when she returns to her home in Selo, the person who’s living there now throws a stone at her and tells her to go away. Is this something that is particular key to the Jewish experience during this period, or maybe to the Jewish community generally? Was this something you intended? I think that the Jewish community at that particular period of time – even before the war – would have considered the fragility of home to be very much a part of their identity, despite the fact that many of them had been settled in that region for a goodly period of time. I think that they as a community were very conscious of the sense of fragility with which they could hold on to a concept of home. And certainly that was the case for them at that particular period of time – it’s an interesting concept… in terms of, where do they belong – you know, if you are Jewish, where do you belong? I think it’s interesting that even today, they would look at Eastern Europe at being the old country, the old home, the old world as though that was in some way a spiritual home to them as well. Actually I hadn’t thought about it much before you raised it, but that is the case. I mean that sense of fragility, having the desire to build a home whether you can find a space to do that. But I did particularly want there to be a sense that there were no easy answers there at all – for anybody. In terms of the homes that she builds, obviously the first home she loses, but we don’t see that. She builds a home with Aleksei, and she recognises the fragility of that home, and I think you’re quite right to point out about Eva mocking her desire to build a home, but there’s a moral ambiguity to that too – obviously [Yael] wheedles her way into the house. In terms of the development of the character, this is a character who goes from being powerless, alone, vulnerable, to developing a sense of how she exercises power. So towards the end of the novel, she’s able to pick up the gun and realises that she has the power to kill. But there’s obviously a growing power there too. So in terms of her home she builds with Aleksei, considering that she is a fifteen-year-old girl and he is older, there is an ambiguity to the nature of the home they set up there. I know some readers have been disappointed that at the end of the novel, there is not that reconciliation between Aleksei and Yael. Yes, which I was possibly expecting. But you’re right that it is a very incongruous relationship – which you kind of forget about when you’re reading it. Because it is I think a very lovely relationship that develops between the two of them. But nonetheless despite that, there is that ambiguity behind it. And of course one of the great hopes that Yael has right from the beginning of the novel is Joseph her brother – the Soviet Red Army soldier who she imagines coming along on his white horse to rescue her, or to rescue them – and that’s kind of her faith. Which of course that could be the good to counter-balance the evil of the Nazis. But of course, for Jews, particularly those Jews fighting partisan groups in the forest, their relationship with the Soviet authorities was particularly ambiguous in itself – obviously Stalin at that period of time was particularly anti-Semitic, and when the Soviets began infilitrating and taking control of the partisan groups, a lot of Jews found themselves in problematic situations. So the Soviets are no great heroes when it comes to this – they are as morally ambiguous as any of the other people there. So yes, at the end of the book she’s kind of left with nowhere. I do have a concept myself of where she went. But where do you go? Where do you find home? Where do you seek to find your home? Where is home at the end of the novel? I mean, what’s the good ending? I don’t know. I was talking to Fania Brantsovsky and it was actually interesting in terms of the conversation I had with her. Obviously, she’s 94, but she’s a very bright woman, a very energetic woman. Interestingly, she would speak Yiddish or Russian or… there was some other language she could have chosen, but she wouldn’t speak Lithuanian. Now she’s lived in Lithuania all her life. OK, it was Poland before the Second World War, but since the age of twenty she’s lived in Lithuania. And I think it was indicative of a really strong sentiment that she did not want to speak Lithuanian. So she could but she was refusing, is that what you’re saying? Well, I cannot believe that a linguist, a highly intelligent linguist who speaks multiple languages, having lived in a country for 50 years, cannot speak Lithuanian. But nonetheless – despite the fact that I can speak Lithuanian, and she couldn’t speak English. And she was a bit difficult, you know – but she was wonderful, and was a really entertaining woman to listen to, despite going through an interpreter. So I did ask her “why did you stay in Lithuania?” Because obviously staying in Lithuania was not necessarily the best of options for her. But she was quite frank – she stayed in Lithuania, because at that point in time she believed that she would find some of her family, that some of her family would still be alive. She would go to the train station every night, and wait; she’d heard that her sister was still alive, and she’d go to the train station and wait. And it was a while later that she discovered all of her family were dead – that they’d all been killed. But what would have been better for her? To go to Israel? To go to America? To go to England? And are they then home? And, you know, how do you finish a story about what happened in the 1940s with a nice happy ending? Positives are in supply, but it doesn’t mean that it’s a happy ending. Since you’ve been speaking both about your experience of living in Lithuania, historical reading, and also teaching in a secondary school in inner-city Nottingham, perhaps a pertinent question is to do with multicultural society. It’s the case that in many countries in Europe, including the UK, this question of multiculturalism being a good thing – which is what I grew up with – is very much in question. And it does seem a book about multiculturalism, but from my reading I don’t think it came come to very clear conclusions about this – obviously it’s not a didactic book as such. But there are moments, such as when the the [Polish] doctor’s wife, who is looking after Yael when she’s giving birth, says “if the law says that I’m to report Jews, then who am I to start arguing with the powers that be? What have the Jews done that I should stick my neck out for them? Did they ever stick their necks out for me, or did the Jewish doctors take away our business?” Is that a sense in some way that a multicultural society is always going to have these dividing lines between people, that people will think “well, it’s us or them, and when it comes down to it, I have to look out for my group?” Or was this just an example of a failed system? Well, it’s interesting that you’ve posed the question in that way, actually. I think we come from the same kind of moral and philosophical background in terms of an understanding of the positives of multiculturalism. I think we kind of thought that battle had been won – that the merits of it were evident, and that there were only radicals on one side that were in any way opposed to that. But what you posit there is actually quite interesting, because one of the things about Eastern Europe at that point of time, one of the things about the Baltics at that point of time, was that it was very multi-ethnic, that it was very multicultural, that there was a constant mixture of languages and different types of people – that in every town and village, people would have spoken at least two, if not three or four different languages. And that would have been the norm – that Lithuanians spoke Yiddish, that Jews spoke Lithuanian and Russian, or Polish, or whatever language was needed there. And so to an extent, it was a great multicultural area – but as you quite rightly point out, although not something I’d really thought about prior to you just making that comment, yes, it’s a multicultural world that intrinsically doesn’t work. Certainly in the early-modern world – this is another of the idiosyncrasies of Lithuania, possibly because it was one of the last pagan nations. Yes, but certainly in the early-modern world, a lot of the Protestants and the anti-Trinitarians found their way to Lithuania, to the Polish-Lithuanian Commonwealth because they were tolerated there, in a way that they weren’t in other parts of the world. And of course that’s why the Jews were invited, because it was another part of the world where they did not get the kind of discriminatory treatment they were getting in Christian countries. So yeah, it does have that great tradition, but you’re absolutely right that after three hundred, four hundred years, it still didn’t end well. And still today, the whole region is riven by jealousies, antagonisms, resentments. I mean, the Lithuanian-Polish relationship in itself is interesting enough – in terms of the fact that I very rarely hear a positive statement about the Poles from a Lithuanian. There is a sense of resentment from the Lithuanians about Poles. This is a really interesting question, I think, and it’s something I’ve noticed not just in Vilnius but in other cities in the Baltics as well – you’ve been left with a very neglected infrastructure, very neglected cities, but at the same time, you also have a very, very complicated historical inheritance, and all of those buildings do mean something to certain groups, some of whom aren’t there anymore. Do you think it’s possible to do this – to make a new city, while still giving adequate respect, adequate care to what has been lost? I certainly think it’s very complex. And it’s actually interesting you picked up that line from The Last Girl – if there was one line in that novel that was very personal to my own experience, it was possibly that line. And very much around the genesis of the novel itself. The novel itself really arose from when I went over to Lithuania, and when I was there for the winter of 1995-96 – walking around the old ghetto area, particularly around Stiklių Street and around Sv. Stepono Street up towards the station, where so many of the buildings were left in complete ruins, which was one of the fascinating things for me. I mean literally in ruins – you could step over the walls into the buildings and see the writing in Hebrew on the walls – and it was almost as though there was this ghost city in the middle of the city, and it really did beg the question: what had happened to the heart of the city? And in a kind of very ghoulish way, it did feel like a monument to a community that had been destroyed – it really felt like that. But obviously it was at that exact point of time when they money was beginning to come in to develop that part of the Old Town, and so a boutique had been opened on that street selling pricey Italian handbags, and the Stiklių restaurant was up and running, serving an up-market clientele. The buildings in the old ghetto district were beginning to look pretty. It did very feel for me that in some way the history was being erased. I got really angry about it at that point in time – it did really seem as though they were trying to hide the history of what had happened, and make it into a nice pretty vision of what they wanted their city to look like. And it was almost like they were painting over the history of their city with a nice thin veneer of yellow-painted plaster. But the thing is, what do you do? You can’t leave your city with a dilapidated centre. Obviously, realistically, you do have to do what they have done in Vilnius. The question is, how do you then memorialise what has been lost? Such a great proportion of the city’s population before the war was Jewish – a third to half of the population was Jewish, and that was annihilated during the Second World War – there needs to be some form of recognition of the community that was lost, the world that existed before the war. Some of the proposals that have been given seem to be almost like a Disneyfication of the Jewish world prior to the Second World War. It’s important to find a way of memorialising a community that’s disappeared while not stopping the reinvention of the city, which obviously has to happen. An issue that all cities have, but which I think is particularly pertinent to the Baltic states, is how do you accommodate the history of your city as time and politics change? In Vilnius and across Lithuania that debate is played out in terms of the renaming of the streets, the taking down of the monuments, and the erection of new ones. This is where history and town planing become deeply political, and in Lithuania’s context, highly controversial. As the physical reminders of the ghetto disappear, streets are named after holocaust supporters. A city has to reinvent itself – a city that doesn’t is dead. But the reappropriation of the city-space should not be a means of perpetuating the work of the Nazis in cleansing the city of its Jewish heritage. So you spoke a little bit about this sense of Lithuania constructing its own historical narrative, and you mentioned this sense of its identity being in question to a certain extent, and I wondered whether this is particularly strong in the Baltic countries – because this does also typify Estonia and Latvia as well, although maybe a little bit less intensely – because their identity is always in question, and it is always realistic to think that they may just possibly disappear, because they have so many times before. And that isn’t really the case for countries like Poland or the Czech Republic or other countries like this – they’re not likely to just disappear from the map or disappear from the world’s consciousness. Yes, there is absolutely no doubt that Lithuania’s sense of themselves is a lot more fragile than other nations. That doesn’t mean that they are necessarily less honest about their own sense of their past. I think in England we are incredibly dishonest about the nature of our own past, who we are and where we are and why we are the way we are – you know we have our own very strong narratives of our story that is actually very skewed and not necessarily very accurate in itself. So I don’t think that nature of constructing an unrealistic history is unique to them, but I think it’s probably much more pertinent, and because they have had much more prompting to call upon themselves to think about who they are as a nation, what does it mean to be a nation, in relationship to external threats, like some aggression that would threaten that sense of identity. So I think they’ve had more cause to think about it than other countries have had to think about it. Having said that, you might of course want to be think that then you’d be more cognizant to the fact you are constructing an identity and therefore you can think about how carefully you want to do that. They are obviously in the process of constructing an identity, and that’s always going to be problematic. But there is lots of debate in Lithuania about their sense of who they are – that’s why it was a great loss to have lost Leonidas Donskis [the Lithuanian philosopher who died in September last year], who was a very rational voice in Lithuania’s sense of who it was, and what its role is. But there certainly is a strong civic sense in Lithuania – there are a lot of voices that argue for a variety of different understandings. In that sense, it’s a good strong democracy, in terms of the sense that it is self-reflective; there is a debate going on in terms of its own identity. There was a huge amount of debate about the removal of those Soviet statues on the Green Bridge [in Vilnius] a couple of years ago – it wasn’t as though there was a universal consensus that they should be gone, and they should be rid of them. There was a real healthy debate within civic society as to whether they should go or whether they shouldn’t go. If they stayed, where they should stay, and if they were taken away, what would replace them. I think there is a good sense of healthy debate in the country, that is acknowledging how it can come to terms with certain things about its past. I wanted to ask about the period of time you first spent living in Lithuania. Because from what I’ve understood from what you’ve said and bits of reading I’ve done, this was in the mid-‘90s? And how did you come to be living there? Because that’s an unusual place to decide to move to – in 1995 in particular. It was completely whimsical – well, whimsical’s not the word. I’d been teaching for a couple of years, quite disastrously, and I’d decided to quit teaching. I was due to start an MPhil in working-class literature in Elizabethan England, back at Goldsmith’s [University, in London]. And I was due to start that in the summer – I had a job as a tutor that I’d sorted out in London. And then I went out on a road trip with a friend of mine. We took a van all the way from Warsaw, and we drove down south through the Czech Republic, through Hungary, Romania, into Macedonia, and then into Albania, and we spent about three weeks on the road, just driving around. And he had a flat in Vilnius which he very rarely went to and he was looking for someone to look after, so every single day he was saying “come on, you must go live in Vilnius.” And I knew nothing about Vilnius whatsoever at that point in time, nothing about Lithuania – had never had any particular desire to go anywhere there either. And where was this particular experience you mentioned? In Poland, OK. Could be many places though. It could have been in any of the countries down there. Although one of the things I found about Lithuania is there was much less of this monumental Soviet style that you find in some other of these European countries. When I went to Lithuania, it felt a lot less Soviet than Poland did, ironically. It just didn’t have this kind of grandiose Soviet style about the architecture. I actually love it, and particularly when I first moved over to Lithuania. The first place I was living was this housing estate in Žirmūnai in Vilnius, which was very much a Soviet dormitory region. And I absolutely loved it. OK, they were five-storey blocks and three-storey blocks, but I think that was more indicative – there are nine-storey blocks [in Vilnius], but the estate I was on was mostly three-storey and five-storey blocks. And they were built around these quads, and they were very quiet, and the grandmas would be out in the central area, and the children would be out there, and there were people playing the accordion in the window. And it felt like village life. And it was a very intimate community. I really loved the Soviet housing areas around Vilnius – I’ve lived in a couple of them, and I did think that they were really nice. So yeah, I ended up there in 1995 really having no kind of concept. It was without a plan; it was quite a snap decision to go out there. And I packed a half-written novel into my bag, and had some kind of notion that I would write a novel while I was out there, because I’d saved up some money to do my PhD, so I had some money in the bank to keep me going for a while. And I imagine at the time it must have been incredibly cheap – far more than it is now. Yeah, it was a lot cheaper than it is now. It was a really interesting time – in fact, it was a really, really difficult time. When I looked back some time ago, I think the crime statistics – particularly violent crime – peaked during that year when I was out there. I think it was a particularly difficult time then. I think three of the banks collapsed, and I think the government was on the cusp of collapse as well, because it was involved in a banking scandal going on there. And I think it was a particularly bleak time – all the optimism of independence had kind of worn away with reality and the difficulty of the first post-Soviet years. But it was wonderful – for me, it felt an incredibly vital place to live. You really got the sense that people very much lived for the day; there wasn’t a real sense of thinking about the future. I remember I came home for a brief visit to Nottingham in January. And it felt like everyone was walking around in a bubble, as though nobody was really existing, as though people weren’t really alive – and I have to say I hated it. I was supposed to be home for a couple of weeks, and I brought my flight forward, and flew back to Lithuania as soon as I could, because I felt very uncomfortable. But I didn’t write a single word – life was far too much fun to be writing. All three of your novels so far have been considered in so way or other with Lithuania – and I know you say your new one is not, but it’s clear that that experience did make a very strong impression on you. Do you think that would have been the case if you’d moved anywhere at that particular age, at that particular time? Or was there something about Lithuania that you really responded to? For me, with the city, with Vilnius in particular, it did feel like falling in love. I really did feel a sense of connection to the city itself. I’d say fairly generally, I do feel a very, very strong connection to Lithuania. Much as I’m often very irritated by the politics; as a country, I think it’s an absolutely lovely country. I feel very much at home when I’m over there – in some ways I feel more at home when I’m over there than when I’m in England. I can’t say that I’d ever felt a particularly strong connection to any of the places that I’ve been before. I lived in Mallorca for a couple of years – and, you know, it was lovely to live in Mallorca, but I don’t think I ever felt that kind of emotional bond. You didn’t feel that you wanted to write about it? Well, on an intellectual level, because there are some interesting things about it, but on a kind of visceral gut sense that you need to put yourself through in order to write 200,000 words – no, not enough do that. I wanted to talk a bit about Noir Press, which you’re running at the moment, which is publishing Lithuanian fiction. Yes, Breathing into Marble [by Laura Sintija Černiauskaitė] came out in December. And you’ve got three others, I think, in the next few months? Yep, we’ve got The Easiest by Rasa Aškinytė coming out this weekend. So I’m looking forward to a big launch party for that this weekend. And then in October, we have Grigory Kanovich’s Shtetl Love Song, and then in December we’ve got Renata Šerelytė‘s book The Music Teacher. We spoke a little bit earlier about the impression that people have of Lithuania in the UK. It’s a country that people have usually heard of but know very little about, or maybe have impressions that are often fairly inaccurate. What kind of challenges have you found in the UK trying to interest people in fiction from this country? I think the challenge is in getting people to read literary fiction. Although I am obviously here peddling Lithuanian fiction, what I’m really trying to sell is good literary fiction that they won’t have come across at all. I think one of the great joys for me is that it’s a great unexplored bank of literature, because there is just so little of it available in translation to an English-speaking audience. Which is allowing me to publish big-name writers – which is absolutely ridiculous really; they should be going to much bigger publishing houses. But because nobody’s been picking up these stories – now the question is, why have people not picked up these books and had them translated before. Because question have to be asked about why Lithuanian fiction has not made more of an impact on an English readership before now – whether that’s to do with the nature of the fact that there have not been enough translators who are capable of doing this before, which I think is partly the answer, but that’s not entirely the answer – because obviously with the Lithuanian-American community there has been enough people who could have done that to a level of quality for that not to have been an issue. I think what is more interesting is why there has been a distinct lack of interest by the Lithuanian-American community in contemporary Lithuanian writing, and I think there is a distinct lack of interest. And I think that’s an interesting question, as to why that should be. But it gives us an opportunity to build up a library of really really interesting books. The stork is a bird that features throughout – obviously giving the book its title, but also being important in a kind of symbolic sense, in that you have this interesting etymological connection, which I didn’t know about. Is this in Hebrew or in Yiddish? In Hebrew, the word for stork is connected to “kindness”. Is that an actual fact, or is that just a theory that they come up with in the book? Oh God, you’re asking me now to go back on my research which was about five or so years ago. As far as I understand – and I did have someone talk to me about it. I believe, “kindness”. I would need to clarify that. But yes, it is a fact that the Hebrew word is connected to that. It does come up because obviously, storks are treif [non-kosher food], they are forbidden, because they’re foragers. And the question is: why has it got such a kind of blessed name when it is treif? So that’s just a bit of background folklore. A related question is that it was a book where I got this sense of kindness as being key, and the question of whether it is something that is inherent to people or to nature. There is a connection with nature throughout the book – you certainly show the brutality and harshness that surviving in a state of nature leads to, but there’s also a sense of faith in nature. For example, when Yael first smells Aleksei, she describes him as “smelling like an animal”, and this seems somehow reassuring, something to trust. The final conclusion seems to be: “if this is possible, she thought, there is hope for earth” – it’s somewhat ambiguous what that is, but it seems to be love or kindness that she’s referring to. Yes, it’s interesting because you’re talking about two separate things and winding them together somehow, which is actually interesting. I mean, nature is obviously one of the themes – nature is one of the themes in part, because realistically for people on the run, living in nature was very much what they had to do, and obviously we’re very disconnected in our own lives from nature in terms of extremes. Living out in it yo’re so much more aware of the brutality of nature, and also of the kindness of nature in terms of that’s where your sustenance comes from. And I also think that rural Lithuania – or rural Poland – that sense of being in touch with nature is very much part of it. And of course, there’s a certain irony that I really did feel, because particularly when they’re snowed in in the cottage, the sense that the brutality of nature halted for that moment the brutality of war was kind of one of the deep ironies of that period of time. And the conversant irony that, as the snows melted, as the days got more beautiful, ironically, that’s when the killing, the murder and the devastation could begin again. There’s a deep sense of irony there that as humans, as the spring came, it became the opportunity for launching yet more attacks and continuing with the destruction. I really felt that, and I can’t say that was on any kind of an intellectual level – that was just me viscerally experiencing their story – that there was that deep irony, that the spring brought death, not life. In terms of kindness, again, kindness is a very odd thing in terms of extremism. It’s an irony again, the irony of war, in terms of the fact that when you have nations pitted against each other in such brutal times – on a one-to-one level, humans were still quite capable of showing enormous kindness to each other. And it’s very, very strange – and that was the case across the whole of Eastern Europe – well, across the whole of Europe, but it was particularly the case with the situation with the Jews. While they met with such incredible brutality, there were many people who also showed enormous courage and kindness in terms of sheltering and caring for people. One of the ironies is one of the characters you referred to earlier was the doctor’s wife, who showed kindness, real kindness, to Yael when she’s nursing her after the birth of her child, while at the same time talking in a very callous manner that was quite the opposite. So the complexities of human kindness – within one and the same person, you can show kindness and acts of brutality. And I wanted to I think in terms of war, we tend to think of heroes and villains – but in actually fact, the experience for the absolute majority of people was neither being a hero or villain, but a very complex and contradictory mixture of morality and immorality, kindness and brutality, and even when we come to the central relationship in the novel, which is the relationship between Yael and Aleksei, which is one that is absolutely built on that gentle sense of kindness to each other – to what extent was that a relationship that was also being used in some way? So that, again, could you say that this is was outright kindness? Yes, you could. I wouldn’t want to be nihilistic about the whole thing, and say that there is no kind of morality without some form of compromising act to it. But I think humans are very complex in the way they behave to each other, and kindness and brutality are often mixed in one and the same person. Yael herself doesn’t behave particularly kindly to Eva when she comes, and basically forces her out into the cold, because of her own sense of jealousy. And regarding the Nazis, they’re certainly seen as being very sinister in terms of their consequences, but as people, those who feature don’t necessarily have this sense of overwhelming evil that you find in a lot of fiction, which often risks giving them a kind of mystique. There is often this kind of mundanity – I was really struck, for example, by the moment at Aleksei’s farmhouse when Yael first comes across this kind of poster sent from the Nazis: the first thing she gets angry about is not the fact that it says such terrible and threatening things about Jews, but the poor typesetting and the fact they’ve misspelt a word – which I looked up and means “vermin” in Polish. This is the thing, isn’t it? When you bring it down to a human level, it’s all that much more complicated. I don’t think we should overly complicate it, because I don’t think the morality is not complicated – what the Nazis did is immoral. But when you come down to a human level and look at how humans behave in a situation, we don’t tend to behave in that way; that’s not how life is. And it’s kind of important that while we do retain a strong sense that we are not compromised here in saying that the Nazis were anything other than abhorrently immoral in terms of what they did, if we miss out on the complexity of the fact that immoral people are sometimes capable of kindness, that moral people are sometimes capable of behaviour that is really immoral, we lend to ourselves to the danger of thinking in our contemporary society that, for example, this person is a good person therefore what he’s going to do is good, or this person is an immoral person, and therefore what they’re going to do is going to be evil – and that’s not how the world works. It’s quite possible that someone who is quite abhorrent could do something that is very good. And conversely, that someone who is fairly good could do something that is fairly bad. I’m not going to argue this about Trump or Obama. But to an extent, you put yourself in the position for myself as a Western liberal where Obama was great and Trump is evil. And yet it’s possible to look at some of the things that happened, and say: Obama was responsible for some pretty heavy stuff, in terms of the drone killings – the amount of civilians who were killed in drone killings during his time in office; and conversely, Trump could be responsible – I’m not saying that he is – but he could be, and therefore we should judge people on their individual actions, and judge individual actions according to their merits as opposed to simply seeing the world as a kind of Disney-esque pitched battle between your hero and your nasty villain, which is not what life is all about. And I think the Second World War we can very much fall into the trap of the grand hero and the nasty villain, and for the majority of circumstances, people are much more complex morally than that, the way that people behave is much more complex than that, much more problematic than that.